Emerging trend-setter and designer, Adrienne Whitewood, is officially launching her first online store today (www.AdrienneWhitewood.com). The launch coincides with her runway show for Miromoda at New Zealand Fashion Week (NZFW) taking place today at 1.00pm. This is the 3rd NZFW for Whitewood who was described by Australasian website, Concrete Playground as the "number one designer to watch this year". Her collection explores Maori motifs and symbolism and is her first fully stocked commercial collection for NZFW. The newly developed website has been built on cutting-edge eCommerce platform, Shopify.com an international industry leader, which has made online stores possible for New Zealand icons, including Karen Walker and Wellies. Both fans and customers will now be able to go online from anywhere in the country or the world and choose from a variety of her original designs. Visitors will be able to shop online securely and easily navigate through her whimsical, elegant and indigenously inspired collections. More pieces will be loaded over the coming weeks. Ms Whitewood branched out last year and currently shares retail space in The Living Room Collective. This step convinced her that what she really wanted was a place of her own and has secured new retail space in Rotorua and will be launching her own store, AHU Boutique, next month. AHU is the Maori word for fashion. It will open on 15 September in Rotorua (1178 Eruera Street). "I wanted to find a tangible way to help others support the idea that buying locally and using sustainable products is beneficial for the whole community. I'll be stocking locally made and designed pieces of art, jewllery and accessories." says Ms Whitewood. AHU Boutique will also stock Ms Whitewood's two collections BLU, and her instore vintage inspired collection." Adrienne Whitewood enjoys blending traditional concepts with pieces that push the bounds of fabric manipulation and technology. Her passion is in weaving together design with cultural narratives, for women who want to have an emotional connection to the clothing they wear. "As women we tend to cherish key pieces of clothing, those pieces mean something to us because they tell a story of something intangible, mystical, something greater then ourselves…" says Ms Whitewood. (TangataWhenua.com) Award winning fashion designer Adrienne Whitewood (Rongowhakaata) will be on TVOne’s Breakfast Show this Thursday (15 Nov at 11.38am) to discuss winning the Cult Couture award last month and will be celebrating the launch of her Spring Summer 2013 Collection. Whitewood's winning piece "Taniko" finds a nexus between Lady Gaga and more traditional Maori costume is a garment constructed from thousands of tiny woollen stitches woven on board. The Cult Couture pulls together a eclectic mix of theatre, music, dance and fashion and celebrates the cultural flavours, innovation and originality emanating from Aotearoa's fashion industry. The Cult Couture Awards encourage designers to push boundaries and create truly unique one off garments. Whitewood’s Spring Summer 2013 Collection has also just been launched and is inspired by her hometown of Rotorua, with shades of gunmetal Lava (which remind us of the beautiful pumice that is scattered along the shores of Lake Rotorua. Never one to pause, Whitewood is currently working on a 700 piece collection with fellow designer Amiria Skipworth for next year’s National Kapa Haka festival, Te Matatini 2013. Inspired from traditional taaniko, we have printed taniko border on light summer fabrics such as silk tissue, cotton/silk blends and tencel. Colour palette is inspired by the geothermal wonderland of our hometown, Rotorua with shades of gunmetal Lava and creamy lullaby. Silhouettes are chic, nipped waists, beautiful pintucks, clever use of light fabrics and gorgeously finished necks. Perfectly light and fresh for the summer winds! Currently based in Rotorua with her work/showroom at RAVE (Rotorua Arts Village) She graduated from AUT with a Bachelor of Design in 2009, established her label Adrienne Whitewood in 2010. 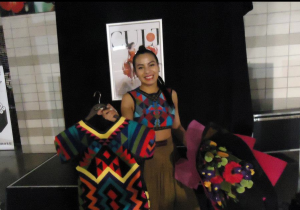 She has shown at NZ Fashion week for the last two years and is currently studying towards a Diploma in Maori at Te Wananga O Aotearoa. Inspired by Maori art and culture, Adrienne Whitewood takes traditional concepts and with them invents unique silhouettes exploring fabric manipulation and technology, her ethos is all about creating wearable clothing for women who want an emotional connection to clothing. In 2010 She debuted her first collection titled; 'Kimihia He Ngaro (Search for the unseen unobtainable)' NZFW and in 2011 Adrienne won the Supreme title at the Miromoda Fashion awards with her Collection 'Te Aho Tapu (the sacred thread)' which will be shown at this year's NZFW, part of her prize package saw her head to Melbourne fashion week, and be mentored by Jack Yan (Lucire Magazine) who has stated that "She has one of the strongest futures out of any of the contestants that have ever entered Miromoda".